Home » What's New » Should I have an Eye Exam When my Blood Sugar is High? At our Fort Worth eye clinic, we see a lot of patients with diabetes. It’s no surprise, as rates of diabetes are skyrocketing in Texas. However, there are a lot of misconceptions out there. Here are a few common questions and issues that come up. Does Diabetes Affect My Eyes? Yes, yes, and YES. Diabetes and high blood sugar affect your entire body and your eyes are no exception. Diabetes is a very significant risk factor in what’s called diabetic retinopathy, a serious eye condition where the blood vessels near the retina swell, leak, and otherwise grow abnormally. This causes black spots, blurring, and, over time, serious vision loss due to the bleeding this causes within. 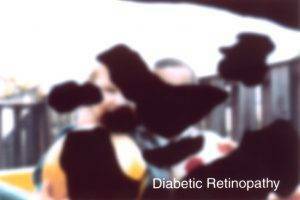 In fact, diabetic retinopathy is one of the leading causes of blindness in the US today. Aside from diabetic retinopathy, diabetes significantly raises your risk of developing cataracts and glaucoma―yet another major cause of blindness. This is why it’s absolutely essential that you see your optometrist regularly if you have diabetes. At our Fort Worth eye center, our optometrists have extensive experience and expertise working with diabetic patients to closely monitor for these conditions, while providing treatment should they occur. Should I take an Eye Exam if My Blood Sugar is High? Do I Need to Tell My Eye Doctor? Again, you ABSOLUTELY need to be screened regularly if you routinely have high blood sugar. However, you HAVE TO TELL US! All too often, we have patients coming in to check their vision for a new prescription without telling our optometrist that they have diabetes! When they go to pick up their glasses and their blood sugar has fluctuated―low and behold the prescription is off and the lenses are a write-off! When your blood sugar is high, the blood vessels constrict and this changes your focus and visual acuity. We simply cannot get an accurate refractive prescription if you don’t tell us that you have diabetes.